Expect a 5.5 GB update on Steam, and up to 12 GB on Uplay. Ubisoft has detailed what’s new in the recent update for Ghost Recon Wildlands Ghost War. An post on the official blog confirmed that the first update—which dropped earlier this week—includes a new game mode, a new class, and four new maps. New PvP mode Uplink pits four against four in a race to hack a central access point (or kill them—either works, apparently). The new maps Warehouse, Oil Rush, Burnout, and Sub Factory will only pop up on this mode, and are designed to "give every team equivalent conditions to run (or sneak) to victory". As for the new class? Disruptors—which are available in early access for Season Pass owners to start with, and then available to all via the store from next week—bring "unique abilities" that permit them to affect the HUD of opponents who stray too close. You'll also get two new maps in Elimination: Cartel Depot and Farm Town. 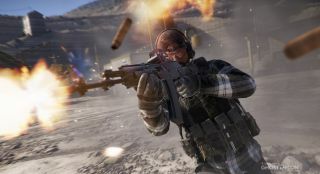 There's also a huge list of tweaks and bug squishing, too, including a fix to an always-on Aim Assist, a 30 percent increase of the Tech's HP, and a change to the Ranger's stamina—it's been boosted by 50 percent along with a tweak to improve the PSG's submachine gun. Oh, and if you've been making yourself invincible by setting windowed mode and clicking and holding the top bar of the game, that no longer works. Sorry, pal. For more, head on over to the official website. We gave Ghost Recon: Wildlands a 67 in our review, stating: "It's easy to assume that any game can be fun with some friends, but Wildlands makes specific, clever design decisions that make for a better multiplayer experience—albeit to the detriment of solo players."